The main reason for choosing this hotel is because it is right next to the Palacio de Exposiciones (the Granada Conference Centre). If you have to attend the a conference it would be the ideal choice. You can walk into the centre of Granada in about 20 minutes. There are also plenty of buses and taxis. This hotel is not far from the ringroad of Granada so it is easy to get to in a car and there is ample easy parking underneath the conference centre. If you are not attending the conference centre you may prefer to stay in a hotel closer in to the centre. 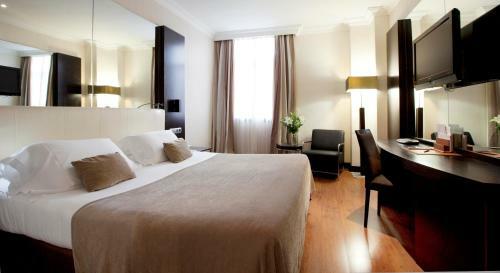 Amenities at the Saray Hotel Granada include family/oversized rooms, a sun deck and a coffee bar. The hotel also offers highchairs, meeting rooms and a 24 hour reception. The hotel also has ski lockers during the ski season. An attraction which is very near to this hotel and is very good for children is the Granada Science Museum. The hotel also has a swimming pool which also may be good for children. This hotel is reccomended for people who wish to attend the conference centre. The fact that is has easy access from the motorway and ample parking may be attractive to some people. This hotel is 1537 metres from the Alhambra entrance, 1301 metres from Plaza Nueva (the absolute centre of Granada), 2483 metres from the train station and 4108 metres from the bus station.